Dink is the Maharashtrian name for Gond (Hindi) or Gum Arabic. Gond ke laddu made along with nuts, dried fruits and some millet flours or rice flour is very common in Indian homes. Every season used to have a different type of gond ka laddu I remember. My mother still makes these laddus almost every 2-3 weeks and eats at least one everyday. Her gond ka laddu ingredients keep changing with seasons and now she adds very little sugar and makes a sugar free version for my father too. In my grandmother's time this laddu used to be a minor ceremony in the house. In summers it used to be a plain gond ka laddu with just some nuts and a mix of flours, in winters some dry ginger (sonth and some turmeric powder would be added and if there is a new mother in the house then gond ka laddu would become a major ceremony. During pregnancy and just after delivery the new mothers would be fed with a special gond ka laddu with many herbs added to them, the laddu will be called Sothoura as sonth is dry ginger and this sothoura had strong notes of ginger and fenugreek in it. This special sothoura laddu is meant to heal the body of new mother and help in lactation too. The whole family and friends would long for the special sothoura made for the new mother. These rituals might get lost in coming times as now new mothers have to rely on multivitamins and antibiotics more and more. Earlier no one took any supplements and real food was the source of all nourishment, the way body recognized it best. I was pleasantly surprised when a very dear friend Suranga Date gifted me a box of dink wadi when we met. Dink wadi is a regional form of gond ka laddu or dink laddu made in Maharashtra. The good things were valued all over the country in different forms. This version of Gond ka laddu tasted really nice and I asked the recipe from Suranga and she happily obliged. Notably, gum acacia or gond has immense health benefits that the older generations were aware of. A study shows how gum acacia helps normalise BMI. 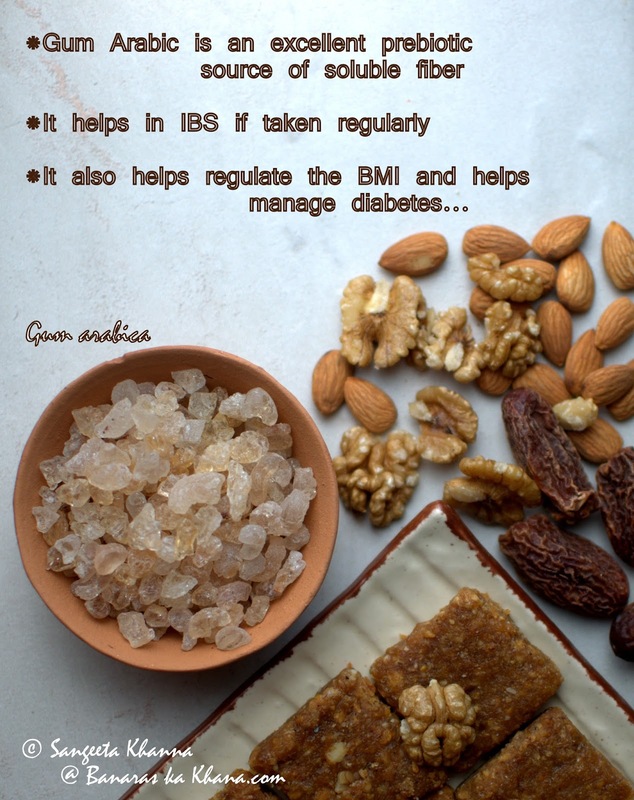 Another study shows Gum Arabic is helpful in management of diabetes, IBS and inflammatory disease. Gum Arabic is also an excellent prebiotic supplement. Our older generations definitely knew better by experience, ethnomedicine is no joke. I am reproducing Suranga recipe as she sent me, in her own words. 200 gms khareek (dry dates which are light brown, wrinkled and hard; khareek is the marathi name). About 600 gms jaggery ; I used the organic suplphurless variety . 2. Spread out the dink , let the oil drain, and then take a nice clean muslin cloth, spread it over the dink, and roll the rolling pin pin all over to crush the stuff . Actually crushing by hands is even better but messy. The muslin cloth will also pick up some extra oil sticking to the dink. 3. Powder the dry dates, walnuts and almonds , separately in the mixer. dry datess will be a bit coarsely ground. 5. On a low flame, in a thick bottomed kadhai, melt the jaggery. In the meanwhile grease two rectangular barfi type pans (eg 10" x 5" ) and keep ready. 6. When the jaggery kind of starts to bubble , boil, and rise (like milk) , shut off the heat, add the dink mixture , nicely mix and bring it all together. 8. Cut the surface into required size pieces, and let it cool. Experts and artistic types might enjoy adding a cashew piece or badaam slivers to the surface . 9. When completely cool, cut the wadis. P. S. This is ideal stuff for a quick breakfast with a glass of milk; or for children home from school who need to rush out to play . I also know someone who would eat this in their daily Mumbai train commute to work . The traditional recipe uses khus khus (poppy seed) powder, grated roasted dry coconut, and khareek powder. This is a shortcut recipe. Even this short cut recipe has resulted in a very flavourful delicious barfee that both of us have been enjoying with chilled milk everyday. I am going to make one batch as soon as this box of dink wadi finishes. Thank you so much Suranga for all the love you bestow. I feel blessed. Omg! Don't tell me I just ate this epic recipe made by Suranga! Having my recipe featured on your blog is an absolute honor. Everytime I make something, it never turns out the same as before. You were , as you just told Amit, plain lucky, and it was one of my good days. And I was absolutely thrilled to know the details of how this gond has been imbibed thru the ages, by knowledgeable folks who used food as their medicine, and ate sensibly. Food was medicine when required, else it was a real pleasure everyday. Now food is a market that knows capturing new avenues everyday :-) that is where everything changed. Thank you Suranga for making me taste the love and blessings in the form of dink wadi. Love. Have heard many say about almond gum roles in controlling diabetes but never hv come across a recipe or a method on how to use it.. Thanks for sharing i have a pkt which which is lying for a long time. its time i shd make these.. m jus worried abt tat frying part let me first try in a small qty.. thanks again !! 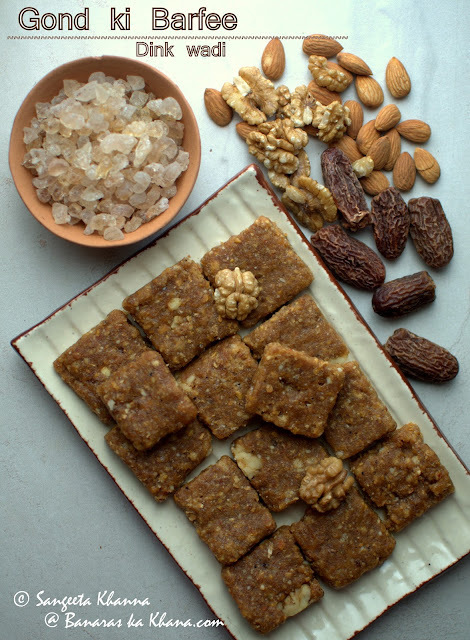 Where can I get organic jaggery? I live in northern CA. Don't remember seeing organic jaggery in the Indian stores. 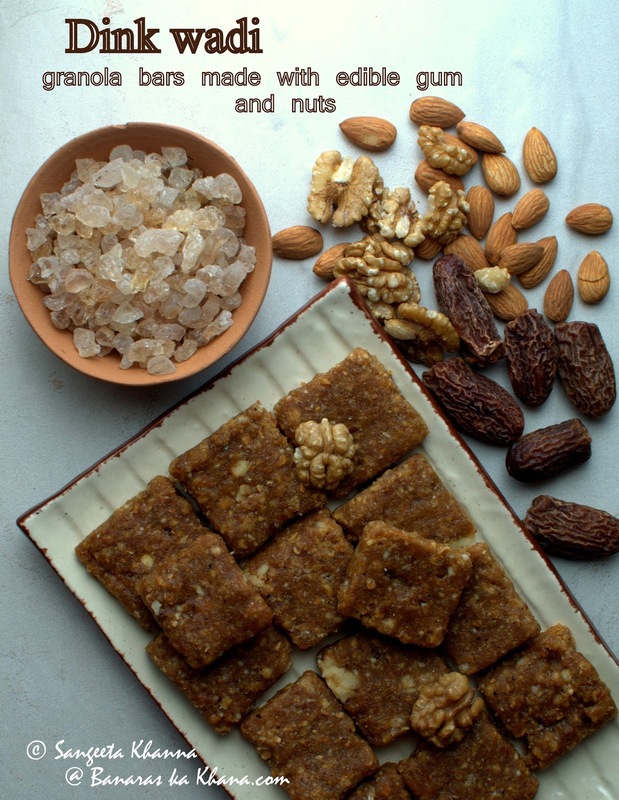 Can you please share the brand of the organic jaggery? Thanks for such a healthy recipe. Want to make it for the family. There is a brand called 24 Organic Mantra and they stock nice organic jaggery. All Fab India stores have that too but it is a seasonal produce as Jaggery is not very stable during summer and monsoon season. Down to Earth (organic brand) has nice organic jaggery and ships all over the world I guess. I Say Organic brand also sells great organic jaggery but I doubt if they ship to US. This recipe brings back so many memories. Mom made it every winter , it was a nutritional suppliment for kids appearing for exams, and most precious memory when my bua ( we called her Atya) made it for me after I delivered kid1.